This post features an in-depth comparison of all of the key features of Beats by Dr. Dre Powerbeats2 vs Jaybird X2, including a comparison chart. Beats by Dr. Dre Powerbeats2 and Jaybird X2 Headphones are both popular with millions of music lovers. But which premium Bluetooth headphones are better? I must start by saying that I love listening to music with BOTH of these premium sports headphones. Sometimes I buy new headphones that cause me to throw all my work aside and just settle down to listen to old favorite tunes. Beats by Dr. Dre Powerbeats2 Wireless In-Ear and Jaybird X2 Headphones both made me do that, and I had a wonderful time with both. 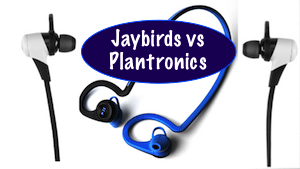 Battle of Bluetooth giants – Beats by Dr. Dre Powerbeats2 vs Jaybird X2 Bluetooth Headphones! These two sets of premium Bluetooth wireless headphones are both popular with millions of people. The Beats by Dr. Dre Powerbeats2 are a bit more expensive than the Jaybird X2, but the price points are similar enough to place them in the same bracket. 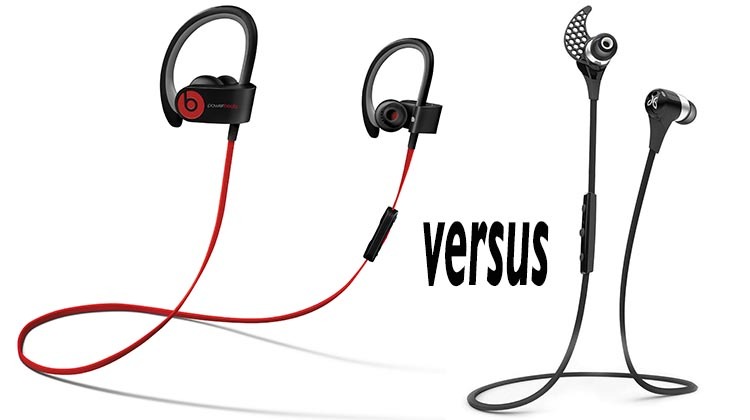 So the question is – which of these two sets of premium Bluetooth headphones is better? Not an easy question, as you will see when you read this post! First off, here is a table comparing key points of the Beats by Dr. Dre Powerbeats2 vs Jaybird X2 Headphones. Battery indicator Icon shows on smart phone to indicate battery level; a voice tells you the level. Plenty of sophisticated electronics to keep you informed about battery level and make sure you are never out of power. Red solid light indicates 1 hour of battery life left; blinking red light indicates only 15 minutes left. However, the reality is that there is no way to see a tiny flashing red light when wearing the headphones - so you will know the battery is exhausted when the headphones stop working! Deciding between Beats by Dr. Dre Powerbeats2 vs Jaybird X2 Headphones is difficult – both have a lot to offer. Jaybird X2 arrive with a beautiful hard case, a generic micro USB with a reasonable length cord, six sets of earbuds (three are silicone; three are Comply Memory soft foam), and three sets of “wings” to anchor the earbuds in your ears. You are told to push the memory foam earbuds firmly into your ears for several seconds, after which they will mold to form a tight fit in your ears. Jaybird X2 seems to require a tight fit. The hard shell case on the Jaybird X2 looks and feels great. Beats by Dr. Dre Powerbeats2 arrive with a good-looking, hard-shell, zip-up case, a proprietary micro USB with a very short cord, and three sets of soft rubber earbuds. The proprietary UBS cord looks good, with colors matching the earbuds. But it’s really inconvenient to have to remember to take it to work, because none of your generic USB cords at work will fit. Queen’s “Bohemian Rhapsody” is a great test of your headphones’ ability to handle complex, layered music – and the Beats by Dr. Dre Powerbeats2 passed the test as well as any I have ever tested (that includes wired headphones). I would have to say a bit better than the Jaybird X2. On the other hand, Joni Mitchell’s “A Case of You” and “I’ve Looked at Life from Both Sides Now” are great tests of the ability of headphones to handle vocals and guitar – and also their ability to convey emotional complexity (admittedly, the second is a much more subjective test). The Beats by Dr. Dre Powerbeats2 and the Jaybird X2 performed equally awesomely with the vocals and the guitar – but subjectively, I felt the Jaybirds delivered emotional complexity more convincingly. They just felt a little bit warmer to me. The detailed layering of complex music such as “Bohemian Rhapsody” is awesome – and that’s not even “awesome for Bluetooth” – it’s just plain awesome. And the Beats by Dr. Dre Powerbeats2 headphones are completely immersive and very loud. No matter how loud you go, the music does NOT distort. Very impressive. Mellow, nuanced, deep, detailed, great stereo quality, deep bass. Performs very well with complex music such as “Bohemian Rhapsody.” And the Jaybird X2 headphones are completely immersive, but not super loud. I preferred “Bohemian Rhapsody” on the Powerbeats2, and I slightly prefer all Joni Mitchell on the Jaybird. Both of these headphones have perfected Bluetooth connectivity. The initial pairing is effortless and fast, and they both pair up instantly every time you need them. With both of them, if you lose your Bluetooth connection for some reason, you can just switch the headphones off and on, and they will instantly pair again. Alternately, you can just tap on the device name on your smart phone to restore the connection. It is much easier to communicate with Jaybird X2 than with Powerbeats2, because Jaybird X2 communicates with a mellow voice, with phrases that include: “Connected; power on; power off; battery full; battery low; recharge battery,” etc. With the Beats by Dr. Dre Powerbeats 2, you get a musical tone when they switch on, and the same musical tone when they switch off. Sometimes it is a bit confusing to know whether you have just switched them on or off. 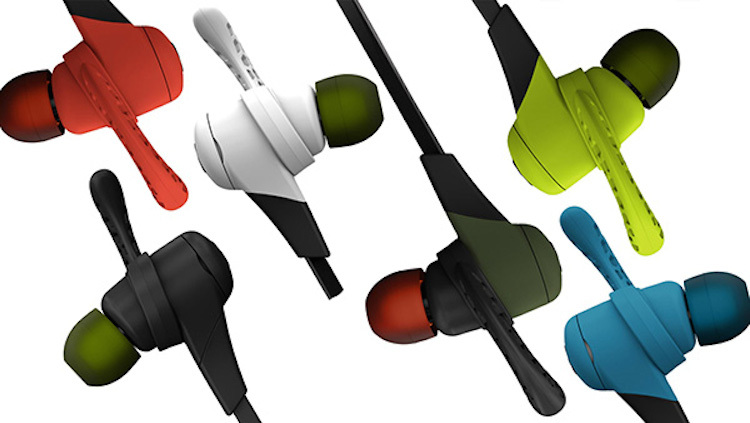 So the Jaybird X2 definitely wins this one. You control the headphones with tiny buttons on an inline controller. You use these controls to do things like starting music, pausing it, advancing tracks and going back tracks – as well as answering and ending phone calls. The Powerbeats2 also have a neat feature where you can “scan” the music – basically putting it on fast forward. These features all work well on both headphones. Bear in mind however that the Powerbeats2 are made specifically for iPhone – they do not work perfectly with Android devices. On the other hand, Jaybird X2 are completely compatible with any Bluetooth device, including iPhone (3, 3S, 4, 4S, 5, 5C, 5S, 6, 6 Plus), Apple Watch, iPod Touch, iPad, iPad mini, the new iPod nano, Android, Windows, Blackberry, Moto Actv wrist-worn sports MP3 players and GPS devices, PC, Mac and gaming devices. A very clear win for Jaybird here. No surprise to find that Apple and Dr. Dre have a business relationship! To use Powerbeats2, you had better belong to the Apple-verse! To be fair, Apple also has a business relationship with Jaybird – you will find Jays in all Apple stores, and also Powerbeats2. In this one, Jaybird X2 has the edge, with 8 hours of battery life, compared to 6 hours for the Beats by Dr. Dre. This is an important win for Jaybird X2. To make matters worse for the Powerbeats2, Jaybird X2 communicates battery charge level much better than the Powerbeats2. For most people, this is the most important information at all – are your headphones going to last for your entire workout/commuter, or are they going to die on you? With the Jaybird X2, an icon shows up on your smart phone to indicate battery level; and a voice tells you the battery charge level. You get warnings for medium level, low level, and recharge battery. With the Powerbeats2, there are no such high-tech luxuries. Instead, a red solid light indicates 1 hour of battery life left; and a blinking red light indicates only 15 minutes left. However, the reality is that there is no way to see a tiny flashing red light when wearing the headphones – so you will know the battery is exhausted when the headphones stop working! Not being able to tell when the battery is low is a major FAIL for Powerbeats2 vs Jaybird X2. But wait! It gets worse! The Powerbeats2 do not automatically switch off when disconnected from your device; and they do not hibernate when not in use (while the Jaybird X2 do switch off and also hibernate). This means that if you forget to switch off your Powerbeats2, you may well grab them to do your workout – and get to the gym to find you are packing dead headphones. NOT impressive. For headphones at this price point, this is a STAGGERING fail. 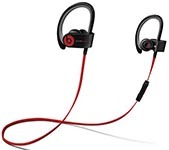 I love the sound quality of Powerbeats2, but I have to say that I feel a bit insulted that Dr. Dre asks so much money for headphones that do not have the electronic smarts of headphones that go for less than half the price (such as the Plantronics Backbeat Fit, which do not have the same quality of music, but which are whip-smart and advanced when it comes to electronics). However, the Beats by Dr. Dre stay in your ears even better. Thanks to the little loops that hook around your ears, it is basically impossible for them to fall out. You could use these while playing basketball, skiing – pretty much anything, and they would not fall out. They are also pretty soft and flexible, so you can mold them to suit your ears. On the other hand, Jaybird X2 earphones do sometimes fall out of my ears. You will need to read the instructions to work both of these headphones, because you have to do a lot of things with just a very few controls. I don’t think most people will be able to figure out all of the many functions intuitively. I definitely could not. You will need to read the instructions to work both of these headphones, because you have to do a lot of things with just a very few controls. On the Powerbeats 2, the controls are on an inline controller. On the left is the clip which you can use to keep the cable tidy. 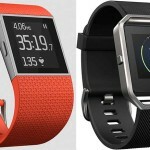 For the Beats by Dr. Dre Powerbeats2, you are going to have to go to the online manual (such as it is, and it really is not very impressive, but it suffices). The printed manual that comes with the Beats by Dr. Dre Powerbeats 2 headphones is so utterly useless that words almost fail me. It’s like a team of experts sat down together and came up with a plan to make a manual that absolutely no one on earth would be able to read. Tiny, 2-point type, white on black, glossy paper, tiny symbols with almost no text. The printed manual is just an insulting waste of paper. I must admit that when I unpacked the Beats by Dr. Dre Powerbeats 2 headphones and looked at the manual, I had a moment of buyer’s panic. The manual just SCREAMS “Style without substance; money without intelligence.” So I was worried that I had bought headphones that looked great but would turn out to be garbage – like the manual. Fortunately, that was NOT the case at all. 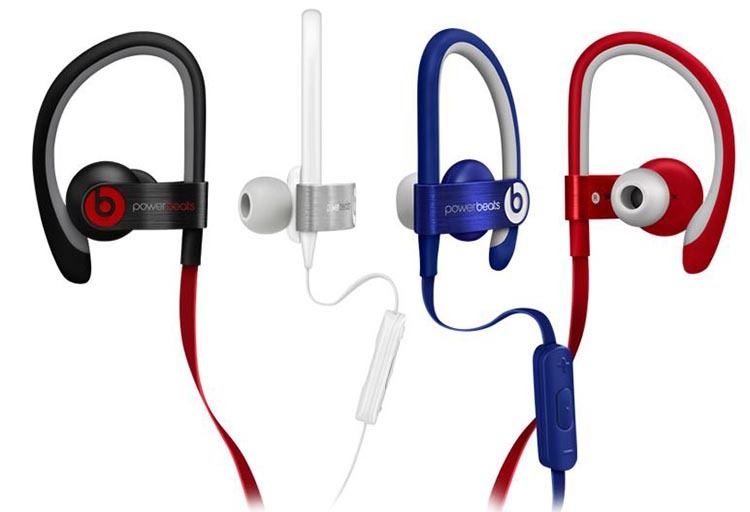 The Beats by Dr. Dre Powerbeats2 look great AND they perform even better. Plus it is kind of nice to have people notice your headphones and say, “Oh, you have Beats – Cool!” Basketball star LeBron James starred in a TV ad that made Beats by Dr Dre much more visible, and invested them with the “cool” factor. The manual for the Jaybird X2 Headphones is not nearly so bad as the Beats manual, and gives you enough information to use the headphones without going online. 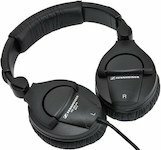 In any case, once you know the control sequences for either of these sets of headphones, and use them a couple of times, they are really easy to use. The controls are tiny, but not too tiny to use. 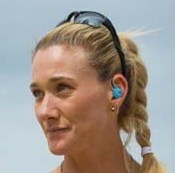 With the Beats by Dr. Dre headphones the controls are on an inline controllers, as is the case with the Jaybird X2. This is one of the toughest comparisons I have ever done. 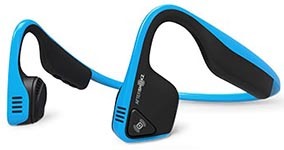 These are both awesome Bluetooth wireless headphones, offering great music for active people without the irritation of wires, but without compromising sound. Beats by Dr. Dre Powerbeats 2 handle complex music, details and layering slightly better than Jaybird X2 Headphones. Both sets are equally immersive, but Beats by Dr. Dre Powerbeats 2 are louder than Jaybird X2 Headphones. Jaybird X2 are slightly warmer and mellower than Powerbeats 2. Bluetooth connectivity is superlative with both, and phone calls are magic. 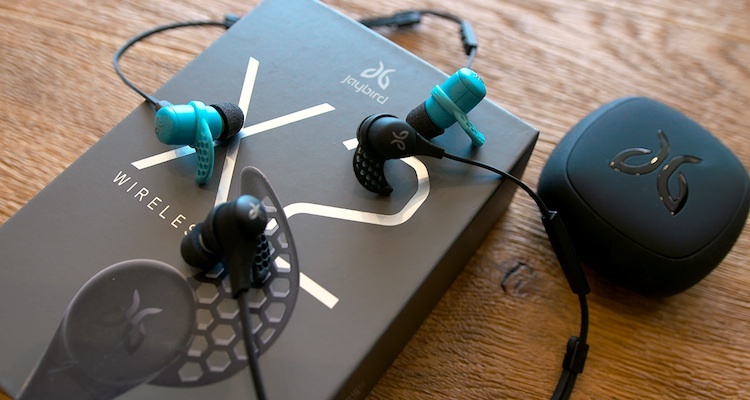 Connectivity/control of the Jaybird X2 is more intuitive and friendlier, but the controls on the Jaybird X2 are a little smaller than on the Beats by Dr. Dre Powerbeats 2. The Beats by Dr. Dre are irritating in that they have a proprietary micro USB, so you cannot use your other cables with it. I also hate that it is super short. 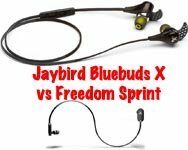 Jaybird X2 has a longer cable and its micro USB is not proprietary. Personally, I love both of these headphones and would buy them both again. But which pair made me turn off the TV, stream my old favorite songs on Apple Music, close my eyes, and scare my dogs (and possibly my neighbors) by relaxing into the joy of music and singing along raucously? For me, that was the Beats by Dr. Dre Powerbeats 2, which just transformed my world while I was reviewing them. But I was amazed at how poor the electronics were on the Beats. Really? For this much money, you can’t even add a voice to tell people that power is low? In the end, as with all things, it will come down to what you like, and what is important to you. However, you cannot really go wrong with either of these premium Bluetooth headphones. Great review. In the last section you refereed to them as bose power beats instead of beats! Hey, thanks man, and sorry for the late reply – my spam machine caught your comment and it got buried with all the real spam. I will make that correction to the post! Thanks Chris, I will fix that! I was wondering since they are both sports related, how are they holding up for workouts or working in the yard? 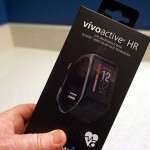 I’ve seen many reviews citing Powerbeats are not holding up to sweat. I love my wire Powerbeats but can’t remember where I put them, so am looking for wireless that will work with using the grass trimmer, pulling weeds, pushing the lawnmower in the hot and humid South. Elaine, sorry for the late reply – my stupid spam machine got your comment and it got buried with all the real spam. 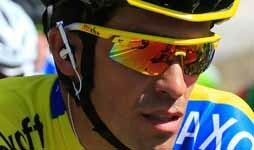 I sweat a lot on my bike, and have never had a problem with Beats or Jays or Plantronics (the three brands I use the most). 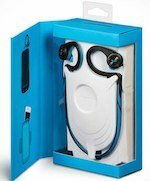 Of course, I actually shower with my Plantronics BackBeat Fit, as they are waterproof – so if you are worried about the climate, you could not go wrong with those. Plantronics are actually my top favorite of all the sports headphones. This was really helpful . I will be exchanging my Beats for Jaybirds. I am sure the Jaybirds will make you happy, Steven. The prices are really good lately, too. The battery icon does not display for Jaybird x2 on android even on Marshmallow, plus there is no app to make it do so (as with the Sony SB-H80. Great, detailed review. 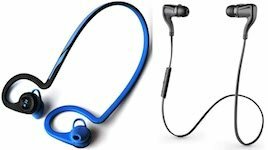 My powerbeats just broke down after two years of intense use and I am looking for a replacement. I LOVE these headphones, but before I found this comparison review I had basically seen no really positive reviews of the beats. I can’t figure out why so many people seem to dislike everything about my favorite headphones, except maybe the very hefty price. Thanks Carl! The Beats do have awesome sound, that is for sure. The Powerbeats 2 are one of the best-sounding Beats products we’ve heard, and the price to performance ratio is — again, for Beats anyway — quite good. There is plenty of bass on display, though it has a booming quality that extends into the lower mids. Mids are cut slightly, and the highs are slightly rolled off at the highest frequencies, though not to the point that detail is sacrificed.